I created this category specifically to put this game in, and it could just as easily have been called ‘Worst Waste of my Time’. Still, I felt that the latter could also describe any of the games that fell into my worst games of the year. The thing is that the game I want to give this award is incredibly well made and, for once, handles Free to Play in a way that managed to make me feel genuinely guilty. I downloaded this originally to tease my partner as she is completely addicted to any sort of Match-3 game. Since it was free I figured it couldn’t hurt to give it a spin. I have now put more than 30 hours into the game. There have been multiple occasions playing this game where I have started rubbing my eyes and wondering why I am so tired, only to look at the clock and it is 2AM. As I mentioned last month it is made by the team that made Puzzle Quest and this is definitely a team that knows how to merge simple gem matching joys with a deep(ish) RPG system. You start with a Hero who will have a weapon that requires certain gem colours to matched up to power it or, if you match skulls, attack with them. They also have different stats for Attack, Magic, Health and Armour. After that is established the game then introduces a party system; there are three more slots for different heroes and monsters which also require different coloured gems to power up their unique abilities and stats. There are well over 80 different heroes and the devs seem to be adding new ones all the time. The key is to find a broad enough selection that don’t all require the same gems to power up, else your team is too shallow. You will need to also make sure that their qualities are different enough, allowing each of their abilities to complement each other. In my case I have settled on a Rex Warrior, Valkyrie, Boar Rider and Templar (lined up in that order). The Rex Warrior is my big puncher. He needs blue and red gems to power up, and when he activates his ability he destroys all the blue gems on the board and adds the destroyed gems to his attack value. It is possible to buff him up to 30-40 attack which will vanquish pretty much anything on the opposing team. The Valkyrie uses Red and Yellow gems to power up and when she does so you can select a gem colour and turn it into blue gems. This helpful for setting up 4 of a kind (which gives you an extra turn to try and match more gems) and also powering up your Rex Warrior and Templar. 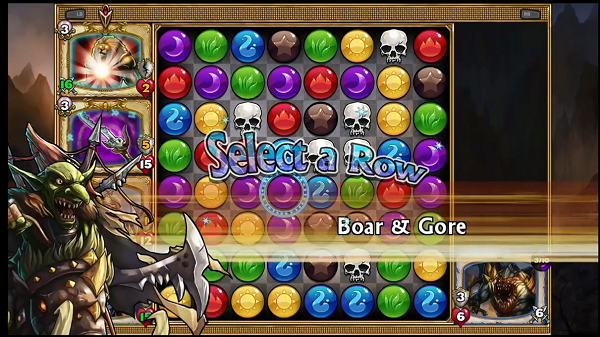 The Boar Rider is the most evil of the cards: it takes purple and green gems to use its “Boar & Gore” skill. This chops through a whole row of gems, does damage to the first enemy in line and automatically allows for an extra turn regardless of what gems drop. The destruction of the row can allow you to set up a handy line of four that you can then use in the next turn. Finally, the Templar uses Blue and Black Gems to power up. When he does he turns all red gems into green ones and also powers up everyone’s armour. So: my setup is the Valkyrie powers up my Warrior and Templar, my Templar powers up my Boar Rider, and the Boar Rider does whatever it damn well pleases. There are plenty of other synergies to be found between different creatures and the ones dealt out to you are random depending on what cards you unlock. This leads me into the currency system. Apart from real money, Gems of War has 7 different currencies (Diamonds, Glory, Gold, Souls, Keys, Magic Keys, and Mana Tokens). Each are used to power up or unlock different content and the headiness of watching those numbers go up next to your Hero Rank and level (powered by other means) is what creates the loop and kept me going beyond level 50. The multiplayer is also compelling. The game does not have true PVP but it allows you to invade other players and fight against AI-controlled versions of their team. There is a guild system (that also levels up and has its own leaderboard) which allows players from the guild to contribute towards tasks that then net all contributors extra keys, diamonds, souls etc. In fact, the system is so good that I have not felt to be particularly lacking in any of the currencies. So much so that I really wish that this had just been a full priced game (15-20 pounds) so that I wouldn’t continue to feel bad about not having given them any money. My only other criticism is that once you hit around level 40 most of the multiplayer stuff becomes redundant as the AI is not good enough to play against me. Sure, there are the Arena (which has you mix up your squad with random monsters) and Treasure Hunts (that change up how you match gems) but there isn’t really enough high-level content for the game to keep its claws sunk into me for much longer. In a way that might be a good thing as I am not sure how much longer I am going to be able to handle that ‘just one more game’ urge. Still, with it available on every platform under the sun you would be better served playing this than one of the other money-grubbing free to play games out there, and there is a good chance you will have more fun with it too. This does sound interesting to me in the same way that Puzzle & Dragons does. Happily this does not, going on what you’ve written, sound like a P&D clone. Hurrah! Another triumph for the mobile space. I may give Gems of War a look but even now, a year and a half on from stopping playing P&D, I feel a little burned out on match-3. Plus I’m already pretty deep in two F2P games, and that’s about the limit of what’s realistically manageable… a fact which I think says a lot about the sink or swim nature of the F2P game marketplace.